Current status  House no longer exists. A bed and breakfast is operated on the property. Richard Tillia Morrison II purchased land from Joseph Legare. 1851  Morrison expanded the place by purchasing 1,000 acres from Samuel B. Jones (3, p. 266). 1852  Morrison built a house on the property to replace the existing one which was in ruins. 1853  Morrison purchased 688 acres from Richard Withers Shackelford to expand his property even further (3, p. 266). Morrison constructed a one-and-one-half story frame house (1, p. 3).
?  During the Civil War, to make money, Morrison made salt from the seawater at Laurel Hill. Several other planters in the area did the same thing (3, p. 239). 1870s  Morrison divided Laurel Hill Plantation into equal parts and gave the pieces to the nine children from his first marriage to Eliza Venning (1, p. 3). 1950  The plantation was sold out of the Morrison family. 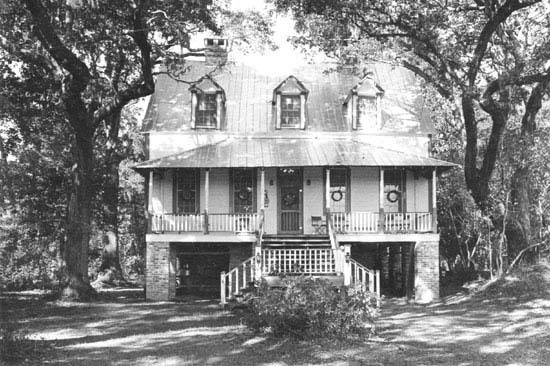 1983  The house was moved to a marsh site on Doe Hall Plantation for restoration by Dr. Richard Leland Morrison III and his wife Jackie. It was destroyed September 21, 1989 by Hurricane Hugo (3, p. 268).
?  Dr. Morrison and his wife, Jackie, began a bed and breakfast on the property. Information contributed by David Constantineau.